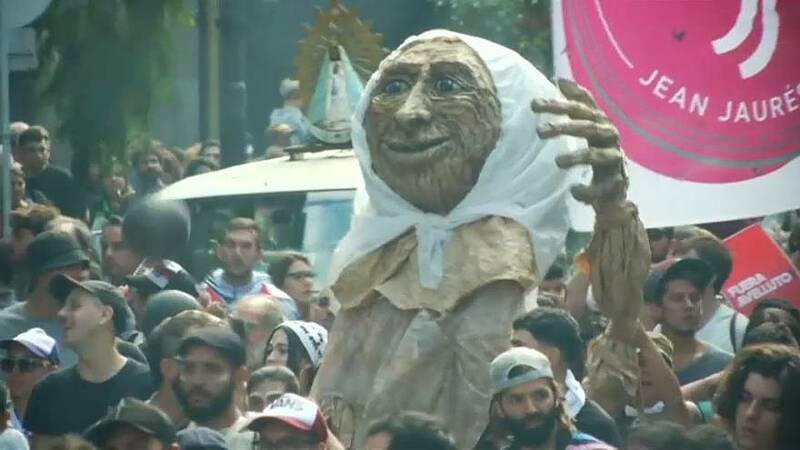 Thousands of Argentines marched on downtown Buenos Aires on Sunday to mark the 42nd anniversary of the country's 1976 military coup and the ensuing violence, dubbed the nation's "Dirty War". Argentina saw the date become a national holiday in 2005, and human rights groups have since used the day to mourn the loss of the estimated 30,000 people who were forcibly "disappeared". Carrying photos of those who went missing during military rule, protesters called for justice for the victims and vowed never to forget them. Marcher Horacio Fermes said: "I remember friends and colleagues who are no longer there, who were kidnapped, and that distresses me. It hurts me a lot." The Mothers of the Plaza de Mayo (Asociación Madres de Plaza de Mayo) came together in their attempt to learn what had happened to their children, and in 1977 began to march at the Plaza de Mayo in Buenos Aires, in front of the Casa Rosada presidential palace. These protests were in defiance of government moves to silence all opposition. The women wore white handkerchiefs fashioned into headscarves to symbolise the nappies of their lost children. Sunday's march was a solemn event, but for some also a day of pride. Attendee Alfredo di Fonzo said: "The truth is that it brings me a lot of sadness, and it also brings me a lot of pride that there are a lot of comrades who fought for the rights of our citizens of that time and those of the future." The military junta swept to power on March 24, 1976, in a bloodless coup d'état to stamp out leftist militants who drew upon the lessons of their countryman Ernesto "Che" Guevara, most famous for helping foment the 1959 Cuban revolution. Washington's early support for Argentina's military rulers reflected the Cold War thinking of the time, which sometimes put the United States on the side of brutal right-wing governments in Latin America.